It's hard to recommend anything other than LS-equipped models for features and price. Getting a bigger engine now requires more than $30,000, which we can't recommend for good value. The 2017 Chevrolet Malibu is a solid mid-sizer in the segment, punctuated by good, efficient powertrains, and a quiet ride. One year removed from a complete overhaul, the 2017 Chevrolet Malibu continues on as a solid mid-sizer with a good set of options and powertrain. In fact, it's hard for us to imagine a domestic mid-sizer that better exemplifies how far the Detroit Three have come in 15 years of American automaking—the Malibu isn't a boring pick any more. Base L models are fleet specials, LS and LT are better suited for retail buyers. 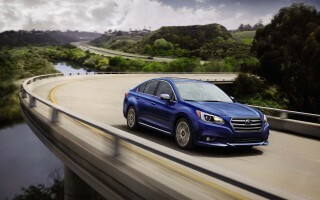 Hybrid and Premier trims round out the top, with dedicated powertrains for each. You'd be excused for overlooking how the Malibu has evolved over the past few years, yet this iteration may attract attention outside of the Midwest. The new Malibu is lighter, brighter, and longer thanks to more high-strength steel in more areas. The nose is lower and its shape has been stretched, but much of the attention invested into new proportions pays off in the interior. The Malibu's cabin is very well considered and laid out, most of the dash has been pushed to the corners and the two-tiered layout is gone. Base trims are clad with nylon that we could do without, but upper trims are pleasant and quiet. This year's biggest addition is a 9-speed automatic paired with the most potent turbocharged 2.0-liter inline-4, which is available only on Premier cars. That engine is the top of the heap, and is a more-than-adequate replacement for a V-6 by churning out 250 horsepower and 258 pound-feet of torque. We haven't yet driven the new transmission on the 2.0-liter, but we're fans of that engine over many of its contemporaries. Far more Malibus on the road will be powered by a 1.5-liter turbo-4 that makes 140 hp and 158 lb-ft mated to a 6-speed automatic. It's perfectly adequate for medium duty commuting, and plenty of power for us to forget some of the old generation's coarse inline-4s. The efficiency champ is the Malibu Hybrid that mates a 1.8-liter inline-4 to a battery pack and electric motors, which is good for 182 hp and—more importantly—48 mpg combined, according to the EPA. The Malibu's diet from the last generation has helped more than the new powertrains, we say. Losing 300 pounds has help the Malibu hone its road manners without being too sharp, and we like its handling—even in base cars. The Malibu manages to be one of the most spacious mid-sizers, despite having a relatively smaller wheelbase. Clever interior packaging helps the car feel more spacious and rear-seat passengers get the benefit of 38.1 inches of leg room. Active noise cancellation and sound deadening help quell harsh vibrations from the road and powertrain, although we're not huge fans of the base cloth material. Safety officials give the Malibu very good scores. 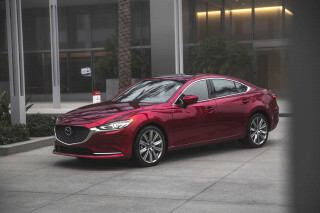 The IIHS has given the car a Top Safety Pick award, while federal testers give it a five (out of five) star score overall. Many retail Malibu cars will have standard rearview cameras, but budget shoppers looking for an L model won't be afforded that luxury this year. If you're willing to overlook the base L model—which is built to attract fleet buyers, primarily—the Malibu is fairly well equipped. A standard 7.0-inch touchscreen with Bluetooth connectivity is standard on LS models and higher, along with Apple CarPlay and Android Auto. LS models also get a Teen Driver feature that tattles on misbehaving young drivers, OnStar with built-in wi-fi capabilities (additional subscription required), rearview camera, 16-inch aluminum wheels, and an acoustic windshield for a quieter ride. More handsome this time around, the Malibu gets better with more options. The 2017 Chevrolet Malibu takes cues its handsome, bigger brother--the full-size Impala--with better proportions, a longer body, and better interior layout that results in a sedan that's far from its malaise roots. Compared to the prior-generation model, the Malibu is longer and lower up front, even though overall weight is down. There are longer doors—designers even had to place a "Malibu" script on the front pair of doors to visually break up acres of flat sheetmetal. The overall shape grants the car a larger greenhouse around the front two-thirds of the car—further emphasized by thinner A-pillars—yet the rear flanks lift and combine with the tail to manifest a narrower rear window than before. Reviewer impressions are mixed regarding the Malibu's bolder interpretation of the twin-grille front fascia design—ranging from "droopy" to "sleek." It's hard to discern where to focus your eyes at first, and it's almost as if Chevrolet's designers attempted to make the Malibu a design midpoint between the brands small cars and larger trucks. Narrower taillights on the Malibu are all the rage for mid-sizers, including Mazda and Kia, yet it's worth pointing out how visually balanced this new Malibu looks and feels, front-to-rear. Inside, the Malibu is charming, if not a little understated. The conventional shape of the dash is a departure from last-generation, thankfully. The center stack houses an attractive 7.0-inch touchscreen (an 8.0-inch version is available, and standard in Premier cars) but Chevrolet has made some interesting trim choices: less-expensive trims use fabric-wrapped panels, a metallic-look on others, and a faux-leather wrap on console and dash on Premier models. Thankfully, GM ditched its reliance on plastichrome trim. Light and nimble, the new Malibu is a joy to drive for a mid-sizer. The 2017 Chevrolet Malibu continues forward with a powertrain lineup without a V-6, only two turbocharged inline-4 engines and one hybrid powertrain. The big addition for this year is the availability of a new 9-speed automatic in its top trim. Most of the Malibu lineup is powered by a turbocharged 1.5-liter inline-4 that adequately subs in for the former 4-cylinder, paired to a 6-speed automatic. It's good for daily commutes and long slogs, only getting caught breathless up mountain grades or highway passes. Even wooded to the floor, the base turbo-4 is still relatively quiet. By the numbers, the base 160-horsepower 1.5-liter turbo-4 produces a stout 184 pound-feet of torque. Chevy intentionally caps upshifts at 5,200 rpm, most likely because any higher in the rev range makes more noise—not more speed. Premier models are powered by a 250-horsepower 2.0-liter turbo inline-4 with 258 lb-ft mated to a brand-new 9-speed automatic for this year. We haven't yet driven the car with this new transmission, but we found that last year's edition churned plenty of twist at low revs, and it happily erased our need for a V-6 in the Malibu. 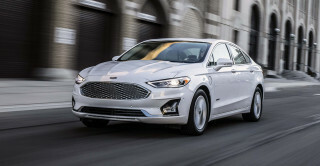 Compared with the 2.0-liter turbo-4 in the Ford Fusion, we might actually prefer the Malibu's version a little more thanks to its refined character. We'll wait until we drive it with its new partner to crown a champion, so stay tuned. The Malibu does without multiple adjustments for the throttle, like Eco, Normal and Sport modes found in other cars. Chevy nailed the calibration for the accelerator, transmission, and steering boost. Thanks for getting it right the first time, folks. 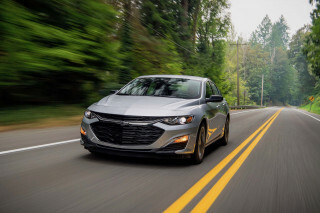 The new Malibu weighs 300 pounds less than the last generation, and it tips the scales at just under 3,100 pounds in base configuration, making it one of the lightest sedans in the segment. The Malibu feels nimble and composed, yet comfortable regardless of engine and trim. Its more tossable than most rivals with a compact-car verve, but still favors ride comfort over hard-edge handing performance. The outlier here is the Malibu Hybrid, which is the efficiency champ. 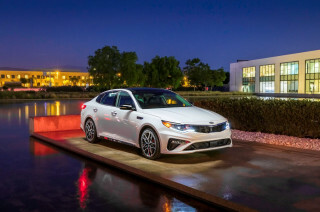 Its 1.8-liter inline-4 teams with twin electric motors and a 1.5-kwh battery pack, the latter of which allows the Malibu to drive at speeds of up to 55 mph on electricity alone for short distances. 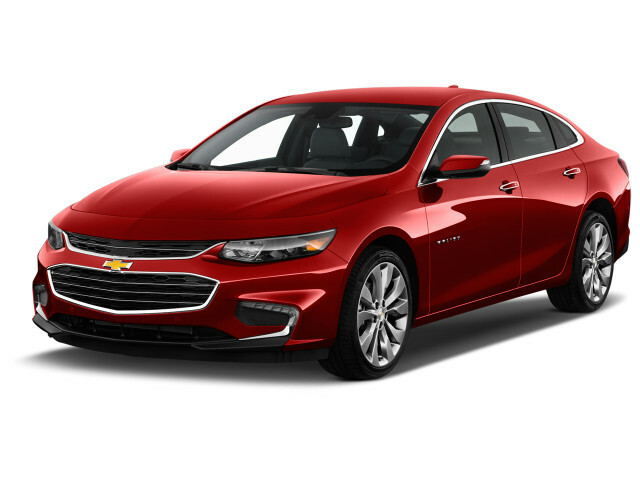 Chevrolet cribbed technology from the Volt for the Malibu Hybrid, but the larger car foregoes the EV button for a well-balanced compromise between conventionally powered cars and ones, like the Volt, focused on fuel efficiency as their main mission. And that's a good thing as the Malibu Hybrid is no slouch, reaching 60 mph from a dead stop in 7.8 seconds. 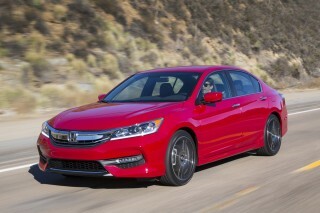 Steering dynamics, too, are vivid, thanks to the Hybrid's comparatively light curb weight of less than 3,500 pounds. But there is some irony here: the Hybrid's gasoline engine is a bit louder--at least in the cabin--than those of its non-hybrid counterparts. Roomy and quiet, what more do you need? The 2017 Chevrolet Malibu received a redesign last year that rides atop a reworked platform. But gone are the days of its plus-size benfits from two generations ago. Even with a 3.6-inch wheelbase extension over its previous generation, the Malibu is still smaller than most mid-size competitors. It's 3.6 inches longer between the wheels than the last generation (and 2.3 inches longer overall), but still in the smaller end of its class. The Malibu is a good study in good cabin packaging, according to us. The front seat area is better with a lower driving position, and the dash has been lowered and pushed out toward the corners that helps open up the cockpit. Thoughtful touches like console padding at knee height, and a little more bolstering and length in the seats, make this an interior that now feels bigger than those of many other mid-size sedans. In front, most adults will find that the Malibu's seats are supportive for all-day drives, or for especially long commutes. We think that rear-seat passengers get the benefit of better packaging. Rear-seat passengers get 38.1 inches of leg room, according to Chevrolet, which rivals the bigger Impala for space. There's good leg support and a flat floor, and the Malibu doesn't eat into head room like some of the curvier, swoopier roof lines in other sedans. We're still not sure that 6-footers will want to move in for the winter, but the back seat isn't an afterthought in the Malibu. Non-hybrid models of the Malibu get 15.8 cubic feet of cargo space, while Hybrid versions only have 11.6 cubes thanks to batteries. The trunk of the Hybrid models doesn't seem to be all that much smaller, although you forgo the mostly continuous flat space for a hump in the middle—that's where the batteries live. For the most part, the Malibu is a smooth operator. Very little engine drone comes through in the gasoline versions, Hybrid models are a little noisier as the engine revs up to match the driver's right foot. Wind and road noise are kept out of the cabin, for the most part, although some rough road vibrations can make their way through the doors. Active noise cancellation in gasoline models helps cut out nasty noises from things like a torque converter locking up at low speeds. The Malibu's budget roots show through in its interior trim and materials. There are plenty of soft-touch surfaces up where it matters; yet the number of color and surface combinations are very limited. Good crash scores and available safety features on top-end models means the Malibu is a relatively safe pick. The 2017 Chevrolet Malibu is one of the safest sedans on the road today, with the official data to back up that claim. 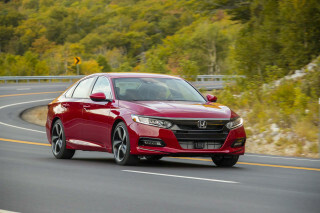 The IIHS gave the Malibu a Top Safety Pick award this year and federal testers gave the car a five-star overall rating. Federal officials gave the Malibu all five (out of five) stars for safety, except in the calculated rollover score, where it earned four stars. The Malibu comes with a standard complement of airbags—10 in all—as well as the requisite stability and traction control systems. If you're willing to pay a little more, there's a lot of available active-safety items in the 2017 Malibu. The list includes a new "Front Pedestrian Alert" that incorporates a forward camera system and through processing, looks to identify pedestrians ahead—and brake automatically to either avoid an impact or reduce the harm. Separately, there's an adaptive cruise control system with front automatic braking. There are also blind-spot monitors with lane change alert, and a rear cross-traffic alert system to help you when backing up. Active lane keep with lane-departure warning is also available, and we like how subtle yet firm the interventions are. And to help with parking, there are front and rear park assist systems and automatic parking assist—a system that helps you with the proper trajectory to quickly get into a spot. Most of the top active-safety features—like front automatic emergency braking—are the exclusive domain of LT and Premier models, however. Base Malibus aren't much to write home about, at least there's good value everywhere else. 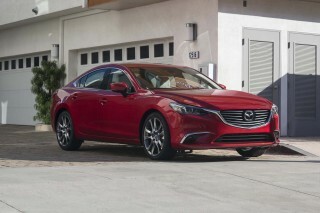 The cutthroat world of mid-size sedans is where we think car buyers can still find good value for money. Want proof? The 2017 Chevrolet Malibu. In base guise, the Chevy Malibu starts at $22,555—a $55 increase over last year's model—but it's hardly opulent. If you consider a radio, cruise control, power windows, and 16-inch wheels to be extravagances of the sophisticates, we'd like to marry you. If you don't, you may not be all that impressed with base Malibu L models. This year's big addition to L models? Floor mats. Stepping up from the L models, the LS, LT, Hybrid, and Premier models are better equipped for daily life. A standard 7.0-inch touchscreen with Bluetooth connectivity is standard on LS models and higher, along with Apple CarPlay and Android Auto. LS models also get a Teen Driver feature that tattles on misbehaving young drivers, OnStar with built-in wi-fi capabilities (additional subscription required), rearview camera, 16-inch aluminum wheels, and an acoustic windshield for a quieter ride. LT models have an available 8.0-inch touchscreen, leather seating, a multi-function instrument display, remote starter, premium stereo, power adjustable heated front seats, leather-wrapped steering wheel and shift knob, 18-inch wheels with sport tires, and wireless phone charging mat. Standard features include 17-inch wheels, LED headlights, and satellite radio. Last year's 2LT package, which made available the larger 2.0-liter turbocharged engine in an LT model, is kaput. 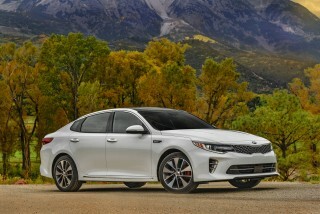 Hybrid models are nearly identical to LT models except for standard dual-zone automatic air conditioning and electronic parking brake—and the hybrid-electric propulsion thing too. Go the distance for Premier models, and Chevrolet rewards buyers handsomely with standard 8.0-inch touchscreen with premium audio, rear seat USB charging, power adjustable heated and ventilated seats, leather-wrapped heated steering wheel, LED taillights, 18-inch wheels, the more potent 2.0-liter turbocharged engine, and a trunk mat if you weren't swayed by any of the other features. We have our nitpicks with Chevrolet's packaging system, notably that we can't have any automatic climate controls unless we're springing for Hybrid or Premier editions of the Malibu. And that, strangely, we can't order an upgraded infotainment without opting for leather seats too? The Malibu earns impressive numbers by the EPA, although we haven't seen much difference between non-turbo models. The 2017 Chevrolet Malibu is very fuel efficient for a mid-size sedan—only more expensive hybrid models do significantly better. 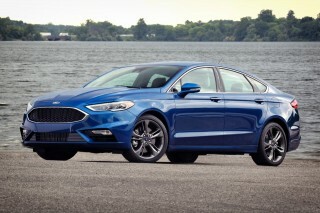 Models equipped with the turbocharged 1.5-liter inline-4 manage 27 mpg city, 36 highway, 30 combined, according to the EPA. Uprated Malibus with the 2.0-liter turbo-4 and a 9-speed automatic are no slouches either. The EPA rates those models 22/33/26 mpg, according to the EPA. Those numbers make it one of the more efficient mid-size sedans without electrification, only the Honda Accord reaches 30 mpg combined too. The Malibu Hybrid should be at the top of any consumer's list who's looking for a fuel-efficient family car. The EPA rates the Malibu Hybrid at 49/43/46 mpg. We haven't driven the hybrid version long enough to make any solid pronouncements about its fuel economy in the real world, but we can report that on a 25-mile long test loop, a Malibu Hybrid delivered a bang-on 49 mpg for us. In real-world testing of the other models, we'd couch the EPA figures with our observations. That's to say, we've seen the same mileage between 1.5-liter turbo models as from 2.0-liter turbo models. In rapid city and highway driving, we've seen mileage in the low-20s from both models, although we think that if your commute involves more stop-and-go traffic, the 1.5-liter should do better. 2009 Malibuwas not made to last, 34,000 miles and trans went , brakes went , door locks don't work. The cars are junk. I have had nothing but trouble with this car. Trans went bad, brakes don't last , door locks don't work. Great family car at a great price. Good interior great looks awesome ride great comfort features a very safe ride really like the car.